10:00 – Welcome from ACIA. 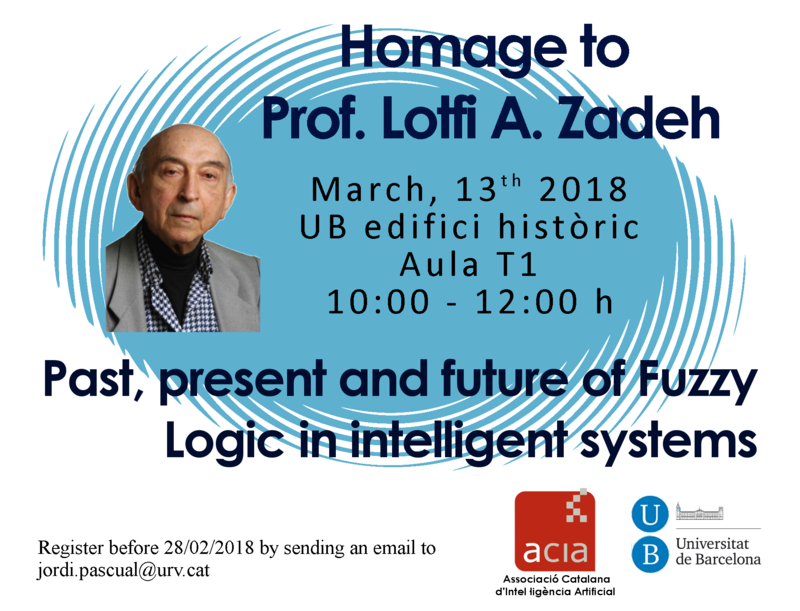 Brief introduction to Prof. L.A Zadeh and Fuzzy Logic. Researcher and lecturer at Universitat Rovira i Virgili (URV). 10:20 – The history and evolution of Fuzzy Logic in Europe, Spain and Catalonia. Emeritus professor at Institut d’Investigació en Intel·ligència Artificial (IIIA-CSIC). Co-founder and first president of the European Society for Fuzzy Logic and Technology (EUSFLAT). 10:40 – What can be done with Fuzzy Logic?. Full professor at ESADE Business School. Universitat Ramon Llull (ESADE-URL). Director of the Department of Operations, Innovation and Data Sciences. 11:00 – Panel: What’s next in research and applications of fuzzy logic? Chair: Dr. Josep Puyol from IIIA. President of ACIA. 11:40 – Group photo, snack and toast for Prof. Lotfi A. Zadeh.